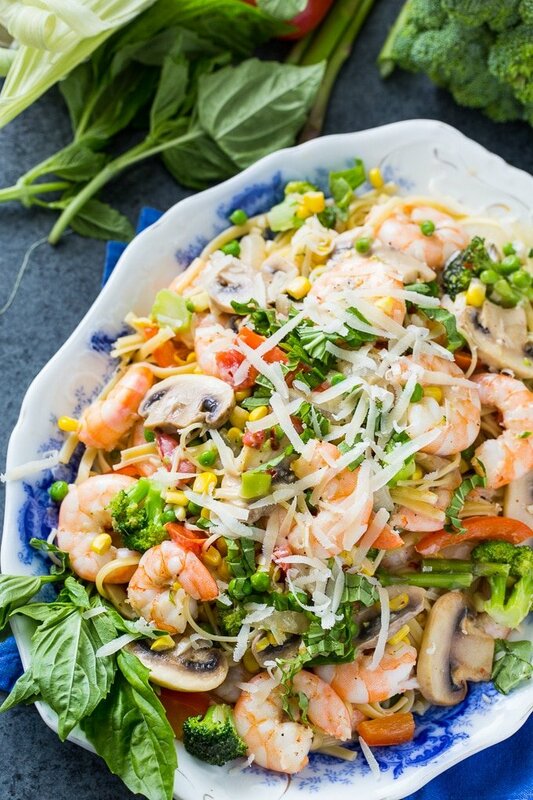 Shrimp Pasta Primavera is full of fresh veggies and shrimp in a creamy sauce flavored with Parmesan cheese and fresh basil. Everything can be made in one pot for easy clean-up. Great for a weeknight meal! This creamy, delicious pasta dish can be made in under 30 minutes. 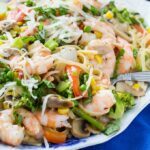 To make this buttery and creamy Shrimp Pasta Primavera, start by melting some butter in a Dutch oven. You’ll want to go ahead and have your pasta cooked at this point and ready to add to the sauce. Add all of your veggies that take a little longer to cook to the Dutch oven. I use broccoli, red bell pepper, onion, asparagus and mushrooms. But zucchini, yellow squash, carrots, eggplant, and sugar snap peas would work well too. This is a great recipe for using up whatever your garden produces. Once they begin to get soft, add the peas, corn, chopped tomato, and garlic. Instead of using a plum tomato, try using cherry tomatoes. Next add chicken broth, heavy cream, salt, pepper, and red pepper flakes. Bring it to a boil and add the shrimp. They only need about 3 minutes to cook. Make sure you stir the mixture frequently so that they cook evenly. Next stir in the Parmesan cheese, basil, and cooked pasta. And there you have it. 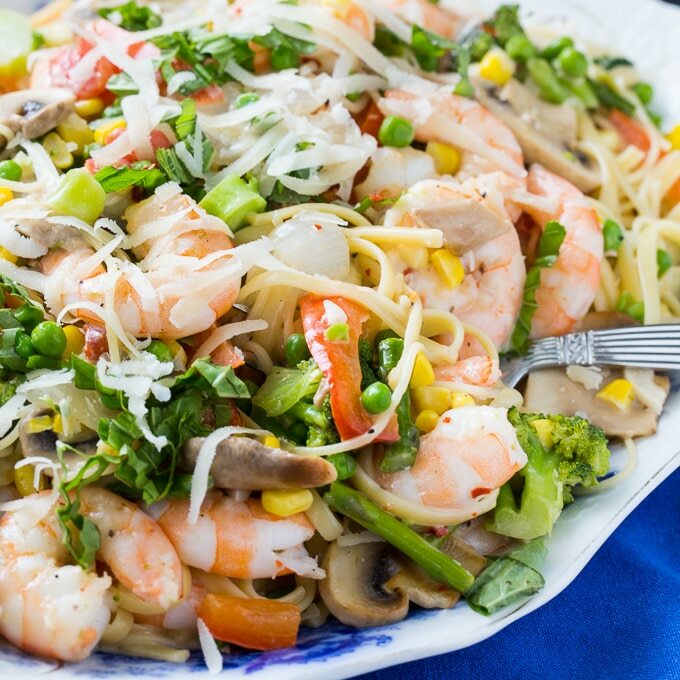 A wonderful, filling pasta meal with lots of fresh veggies and shrimp. 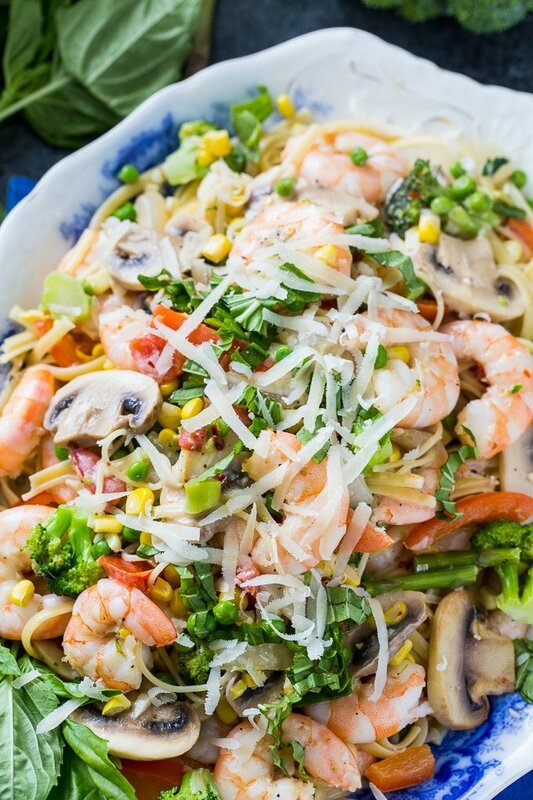 Shrimp Pasta Primavera is full of fresh veggies and shrimp in a creamy sauce flavored with Parmesan cheese and fresh basil. Can be made in under 30 minutes! Add peas, corn, tomato, and garlic and cook another minute or two. Add chicken broth, heavy cream, salt, pepper, and red pepper flakes. Bring to a boil and then add shrimp. Stir and simmer until shrimp are cooked through. Stir in Parmesan cheese, basil, and pasta. Serve with additional Parmesan cheese. This entry was posted in Main Dishes and tagged pasta, shrimp. Bookmark the permalink. Pasta looks nice and also great recipe. good work keep it up..! !